I want to thank everyone who took the time to come and play in our Paper Piecing Challenge this week. I am so excited to have had this wonderful turnout for my 2nd time to host, but the larger participation made it even harder to choose a winner. We had so many lovely cards submitted this week. The Design Team really enjoyed seeing your beautifully paper pieced creations! Well, I guess I better get to it. 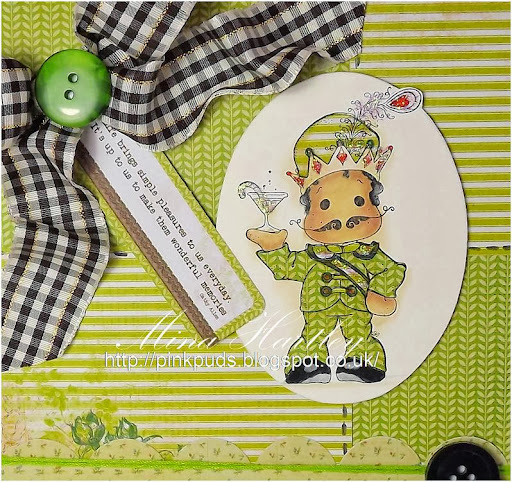 This week's winner is...........Mina with this beautiful card! I fell in love with Mina's little Edwin image the minute I saw him. What a fun little guy he is and look at his snazzy clothes! Congratulations, Mina! Please contact me at sharynp281@comcast.net and I will send your badge to you. I would like to recognize two other cards that caught my attention. 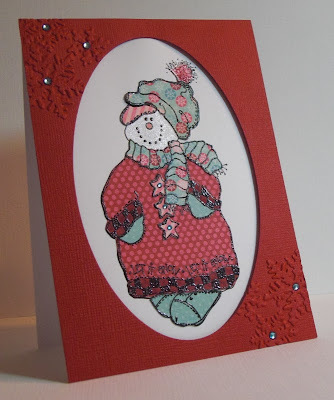 The first one is this little snow lady by Greta H. Isn't she sweet all bundled up to keep out the cold! 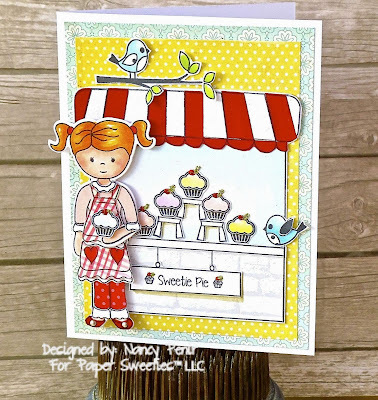 The second is this sweet little girl and her cupcakes by Nancy Penir. Love the colors on this one, and her pretty little apron and pants. Thanks, ladies, for sharing your talent! I hope you will check back with us tomorrow when Vicki reveals her Color Challenge, until then.......................Happy Stamping! Thanks so much for the shout out! Looking forward to playing again. Great job, Nancy!!! Congrats to everyone. Wow! I love this challenge blog! Thank you for shout out, hugs to all of you!